TrunkSpace: You travel the country sharing the message of “embrace your story.” Your particular story has a lot of layers, and your life has no doubt taken many unexpected twists and turns. Can you tell us what “embrace your story” means on a macro level and at what point in your life you started following your own advice and accepted your personal truth? Allen: On a macro level, we are experiencing an amazing time in human history. People who once lived in fear of expressing their truth are now reclaiming their voice and sharing their experiences. I believe that everyone has a right to express the truth of who they are and show up authentically in the world. Anything less than the full expression of who we are compartmentalizes our lives, drains our potential, and causes us to live in fear and hiding. When you embrace your story, you make a conscious choice to live in your truth. When you do this, you overcome fears, doubts, and insecurities because you realize that by accepting your truth you have nothing to hide. The incredible thing that happens when you share the truth of who you are is that you open yourself to connect more deeply and build more meaningful relationships with the people in your life, and ultimately, this leads to growth and the potential for healing. For me, it was hard to accept my personal truth, and I’m always striving to grow and expand further in my understanding of who I am. At 21 I was removed from society and imprisoned for more than six years. During this time, I did a lot of soul-searching and took a hard look at the consequences of my actions. I found that in taking full responsibility for my past, and for claiming my truth, that I am free to choose who I will become. TrunkSpace: Your third book, “Evolution: Becoming a Criminal” will be released on June 19. Now that you’re three books in, has the process become easier and more fluid? Are you experiencing the same emotions on the eve of releasing this one as you were your debut? Allen: This third book is the book that I didn’t have the courage to write years ago when I released my first book. Doubts and fears from my past were still gripping me and prevented the full expression of who I am. My first release came with mixed emotions. With this release, I mostly feel gratitude for the ability to express and share my story. Of course, it still comes with a twinge of fear, wondering, “will people like it,” which I believe comes from my own desire to be loved and accepted for who I am. When I feel that fear, I lean into the hopes that my vulnerability will speak to something that someone may be experiencing in their own life. TrunkSpace: You were involved in a well-known heist at 19-years-old, which is about to be more well-known thanks to the movie “American Animals.” Referred to as the Transylvania Book Heist, the caper involved you and three other individuals attempting to steal first edition books and paintings from the Transylvania University library. Is there something poetic in the fact that you are now an author and creating your own books, and has writing opened the doors of redemption to you on a personal level? Allen: I felt so misunderstood years ago, after the crime. I felt ashamed and embarrassed at what I had done and deeply sorry for the pain that I had selfishly caused other people in the process. After such public self-destruction, I had a strong need to express that this crime does not define who I am. Writing provided me the outlet to communicate and share the truth of who I am and my experience from the only perspective over which I have any authority: my own. Poetic? I would say it has been a long and continued process of healing. TrunkSpace: In a way, has writing the book “Evolution: Becoming a Criminal” been a bit like therapy? Has it enabled you to articulate thoughts and feelings about your own experience in a way that you have yet to tap into prior to putting it down on the page? Allen: Writing is always a therapeutic process for me. When I write, I envision the scene I am writing as if I am there, walking around in the scene, feeling, seeing, hearing, and experiencing as if for the first time. In the process of writing this book, the scenes I stepped into were reliving my past experiences, over and over, and over again. As the old emotions flowed into me, I allowed them to flow through me and out of me onto the page, where they now live. Allen: I overcame a lot of shame about my past through the process of writing this book. I would say that I am most proud of the internal process that I went through to be able to share the story of who I am through the release of this book. TrunkSpace: Obviously there is a fictional spin to “American Animals” in order to make it more “cinematic,” but is it an odd experience seeing someone slip into your skin and inhabit you? Is it at all like holding up a mirror to yourself, or is there enough separation between reality and the film that you can still feel distanced from it? Allen: It’s surreal. In parts of the film, I see Blake Jenner reenacting pivotal moments in my life, and I flash back to my own memories of my experience. His portrayal captures so many layers of emotions that I experienced at the time. I’m grateful to Blake for such a brilliant and authentic performance in the film. TrunkSpace: How long did it take for you to discover your voice as a writer? Allen: I spent years studying the craft of writing, emulating my favorite authors. “Shantaram” by Gregory David Roberts is a book that made a big impact on me. I think reading his writing showed me it was possible to be strong while at the same time vulnerable in the expression of our flaws. I think though that I found my personal voice when I stopped trying to emulate other writers. Mark Twain famously said, “Write what you know.” In seeking to know myself, I think I found expression for that part of me that most needed a voice. TrunkSpace: Regarding the process, is writing a labor of love for you or does it feel more like labor? Do you enjoy the process? Allen: It depends on what I am writing. I like to feel deeply connected to my writing. If the connection is there, I love and enjoy the process. The projects that I most enjoy are projects that allow me to explore the human experience on a level that makes us all feel a little more connected to one another. TrunkSpace: And what does that process look like? What are the ideal conditions for putting in a good day of writing? Allen: My writing days usually look like this: Instrumental music in the background, usually a beat with a good base-line, sitting at my desk in my high-backed roller-chair, pretending to be a captain of a ship about to embark on a journey, with my dog, a Shiba-Inu named Cleo, curled up at my feet. I love those days. TrunkSpace: Do you self-edit as you write? Allen: I do. Some days I feel completely present and tapped into my source, the source, the place where all creation comes from, and the writing flows. I find myself rarely editing on those days. Other days, usually when I’m in a stage of overcoming something in the present moment, I find myself facing resistance, and the writing feels forced. Those are the days I edit and revisit my writing again and again. I find it essential to write through the challenging days because there is always something in there that you needed to express before you can get to your next level of awareness. TrunkSpace: Where are you the hardest on yourself as a writer? Allen: I used to be a perfectionist. I still grapple with that every now and then when an internal critic wants to chime in while I write. Now I try to be more understanding of myself and embrace my weaknesses and strengths equally as part of who I am and try to recognize that the good days and the challenging days are all part of the overall process. You can’t have one without the other. TrunkSpace: What are you working on now and what will people be able to read next? 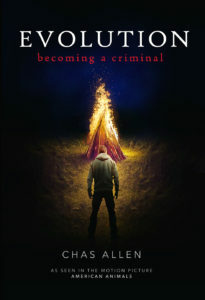 “Evolution: Becoming a Criminal” is available June 19 from Motivational Press. You can pre-order here. “American Animals” is in theaters now.